Δεν έζησα απομονωμένα και περιφρονώ το σοφό που δεν έζησε πραγματικά τη ζωή και το λόγιο που έμεινε αμέτοχος. Υπήρξαν πολύ σοφότεροι από εμένα, αλλά λίγοι έχουν διανύσει τόσο δρόμο. «Έχω δει τη ζωή από πάνω προς τα κάτω κι από κάτω προς τα πάνω. Ξέρω πώς φαίνεται από μέσα κι από έξω. Και ξέρω πως υπάρχει σοφία και πως υπάρχει ελπίδα." L. Ron Hubbard (1911-1986) is the Founder of the Scientology religion. The first Church of Scientology was established by Scientologists in Los Angeles in 1954 and today spans the globe with more than 11,000 Churches, Missions and affiliated groups across 167 nations. Mr. Hubbard’s researches into the mind and spirit are available in materials that include 18 volumes of technical writings, 12 volumes of administrative works and 3,000 recorded lectures describing various aspects of Dianetics and Scientology. Dianetics: The Modern Science of Mental Health, his best-known work, has appeared on 600 bestseller lists since 1950 and sold 22 million copies. His body of fiction and nonfiction works comprises more than 100 million words. 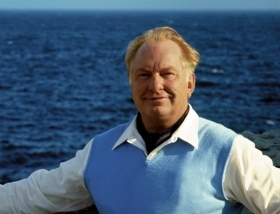 L. Ron Hubbard left an extraordinary legacy: an immense body of wisdom that leads Man to spiritual freedom; the fastest-growing religion in the world today; and an organizational structure that allows the religion to expand without limit. Mr. Hubbard also wrote extensively on the subjects of education, drug rehabilitation, morals and many other areas and developed technologies with broad application in secular programs including Narconon, Criminon, Applied Scholastics and The Way to Happiness.